Step 1: Powder the mold with talc, aim for a smooth coat through out the deepest recesses of the mold. Shake free any access powder. The talc performs two functions. First, the talc helps pull the resin into the corners of the mold for better casting. Second, it reduces the impact of moisture on the resin. Step 1a: Spray mold release into the mold. Using a mold release will prolong the life of the mold, preventing tearing of the RTV during demolding and restoring oils to the RTV leached out by the resin. This step is optional if you plan to only cast a few (fewer than a dozen) copies, or have mold with few undercuts to pull at the rubber. Step 2: Pour equal amounts of part A and part B resin into the 8 oz plastic cups. If you are casting a sizable portion of resin, say a few ounces or more – you will be able to eye ball the volumes. The resin is forgiving enough to accept slight variances in the mixture. If you are casting small parts, you may want to look for a marked syringe or other measuring device to more exactly draw the resin. Step 3: Pour the measured units of part A and part B into the 16 oz cup. A few quick stirs will blend the two components. Part A is colored a beer like yellow, while part B is a clear goo. The coloration makes it easy to see when the resin is properly mixed. Step 4: Pour into mold- at this stage, the resin will pour like milk. Three minutes may not seem like much, but it’s plenty of time to mix and pour up to 16 ounces of resin. Fill the mold cavity to the lip of the mold. The resin will not be completely flush as surface tension either pulls it up the side of the mold (if the cavity is under filled) or pools over the top of the mold (if the cavity is over filled). In the case of an over filled cavity, use a plastic spackle scraper to level the resin. Step 5: Over the next 10 minutes, the resin will first turn cloudy, then become a dull white/yellow color. The innermost portions of the mold will cure first as the resin works up the necessary heat to harden. Once the entire surface has changed to a solid state & the product is cool to the touch, it’s safe to de-mold. If your mold has any features that make demolding difficult, you may want to wait more than the listed 15 minutes. Other wise, you run the risk of twisting the still setting resin. 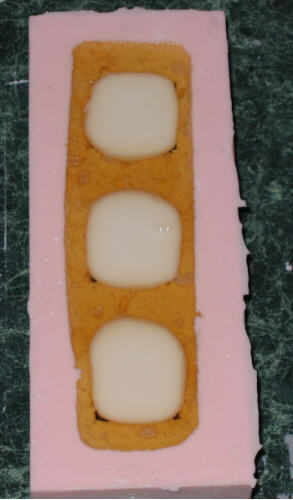 Example of resin turning cloudy. Final thoughts: Take care with the resin, wear a pair of rubber gloves- the last thing you want to do is splash resin on your skin. Standard dish washing gloves work well for me. Work on a surface that is either disposable or hard & smooth. I work on a counter top & spilled resin peals off with out any trouble. Resin is not a product that can be kept around for long periods of time. Moisture from the atmosphere slowly degrades the product every time you open the jug. Once the manufacture’s seal is broken, expect to use the resin in the next month or two. Resin contaminated by moisture will foam when cast, giving an swiss cheese like effect. I am trying very hard to paint smooth cast 320 from smooth-on. The paint will stick ok, but if you scratch it at all, it comes right off. Do you have any suggestions at all… I am getting very frustrated!!! Hi Larry – do you use any sort of spray primer? For most of my painted pieces I’ll use cheap black from Home Depot, then over spray with my next major color. So far, the paint has not come off when scratched – but I have not yet given the pieces a real work out. I have heard that if instead of using a release agent (which i never use and it works fine without) and spray the inner part of the mold with the color you’re wanting it then pour in the resin it will bond with the paint and won’t come off at all. you can also use Krylon Fusion for Plastic and it will bond with the plastic as well and won’t come off. You have to be careful and use light coats or it can cover up detail pretty easily. Whenever I use mold release it makes the surface of the casted piece very cloudy. The resin is mixed properly, it isn’t cloudy anywhere else..Any suggestions? Hi Lauren – you could try using only the talc as a release agent and skip the spray. The talc will help fight bubbles and create a clean cast. Skipping the release spray will be a bit harder on the RTV (the mold will dry out quicker), but if that’s what it takes for a clean cast – you can always pour a new mold. I had a couple of casts turn out cloudy when I first started casting. What I tried that seemed to solve the problem was to spray the Universal Mold Release in first and then hit it with talcum powder instead of the other way around. I haven’t had that problem since. A common reason for the cloudiness could also be pouring the resin before it’s been mixed thoroughly. Make certain that you’ve mixed it until it’s clear in the cup. This usually takes about 30 seconds if you are mixing slowly in order to avoid bubbles in your mix. Do you have a good source for the syringes? I’m casing some small parts and using cups is getting tricky with the tiny volumes I’m working with. I’ve worked with Smooth On 320 resins and I love them. My only problem is that sometimes the a small part of the surface of castings seem to extrude some sort of clear fluid which is very hard to remove; Once you clean it out, a new film appears in a few minutes. This film can’t be painted over because the paint doesn’t set when it mixes with the film. This is my only major problem with this resin and I’m at a loss as to how to remove this pesky fluid. This phenomenon occurs in about 10-20% of castings, but is quite troublesome. Does anybody else have this same problem sometimes? Any advice would be helpful. I’ve heard of this problem before. It happens when the resin is not fully mixed & one of the two parts is leaching out of the casting. The solution was to coat the filmy area with talc & wait for it to harden, then sand off the talc. Repeat until the film stops appearing. Somewhere there is a forum post from Jed of Antenocitis workshop explaining the problem and the solution. Thank you. I tried it and it worked. Sometimes the oil extrudes somewhere else, but at least now I have some “band aid” solution handy. Again, Merci! great tutorial. do you have any tips on avoiding bubbles. I have been making my own moulds and casting small parts with quite a bit of small detail on them. You can get some cheep syrenges at Wallgreens.. THey have a 30ml capacity but they are only $0.50.